Hello my Crafty Friends welcome to my blog. Today is a new challenge on Elizabeth Craft Designs Blog. This month it is Garden Notes Frame It / Stitched Inspiration using Susan’s garden Frame It Stitched dies. 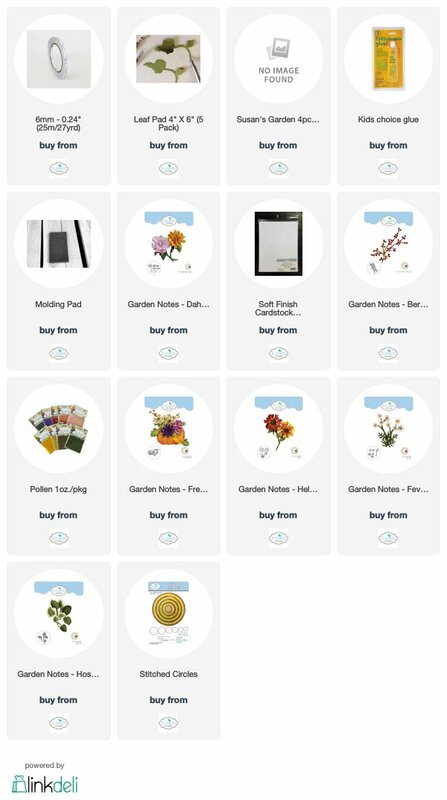 I chose to use the squares along with Garden Notes Wheelbarrow and Windflowers. Be sure to visit Elizabeth Craft Designs Blog to see all the great creations by all the design team members and of course answer the question for a chance to win a gift card. https://blog.elizabethcraftdesigns.com/2018/12/elizabeth-craft-designs-designer-challenge-december-2018/ . 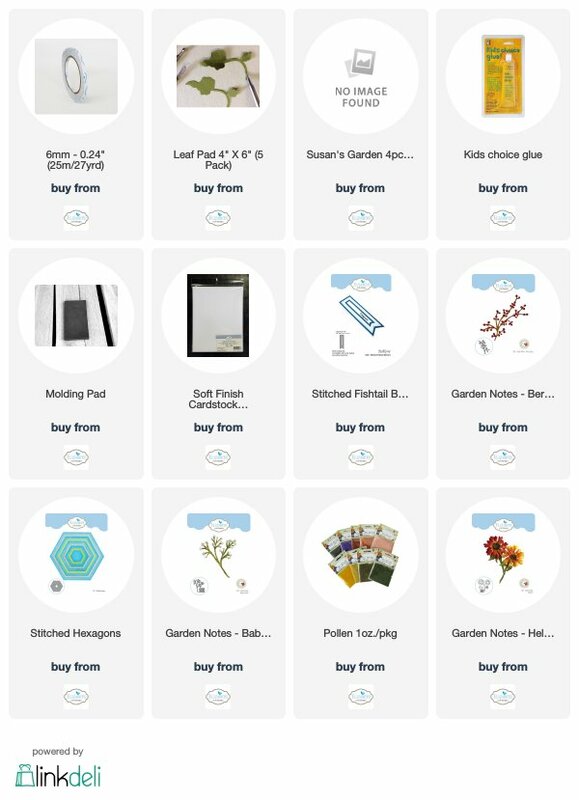 The question this month is Which of the Garden Notes Frame It / Stitched die sets would you use on a project and how would you use it. Step 2 Cut patterned paper 6″ X 6″ (ModaScrap Relax in the Garden used here) adhere to card front using Clear Double Sided Adhesive. Step 3 Cut 6″ X 6″ white Soft Finish Cardstock using largest die from Garden Notes Fitted Frame / Stitched Squares die set cut center from cardstock making frame. Using dimensional tape adhere to card front. Step 4 Cut 2 Garden Notes Wheelbarrows from white Soft Finish Cardstock with Clear Double Sided Adhesive on back. Adhere one on top of other. Color using alcohol markers in color of your choice. Add dimensional tape on back adhere to card front. Step 5 Cut 5 Garden Notes Grecian Windflowers from white Soft Finish Cardstock leaves from green cardstock. Using alcohol markers color 2 flowers in color of your choice leave 3 flowers white. Shape flowers and assemble. Yellow pollen is used for centers. Susan has video on her Facebook page Susan’s Garden Club found here. Step 6 Die cut word “happy” from black cardstock which has Clear Double Sided Adhesive on back using Word 1 – Celebrations. From same cardstock using Joset’s Blackboard Numbers cut 75th. Adhere to upper left of card front. I do hope that this tutorial has inspired you to create. Be sure to go to Elizabeth Craft Designs Blog to see all the other creations by the design team and answer the question for a chance to win a $20.00 gift card. 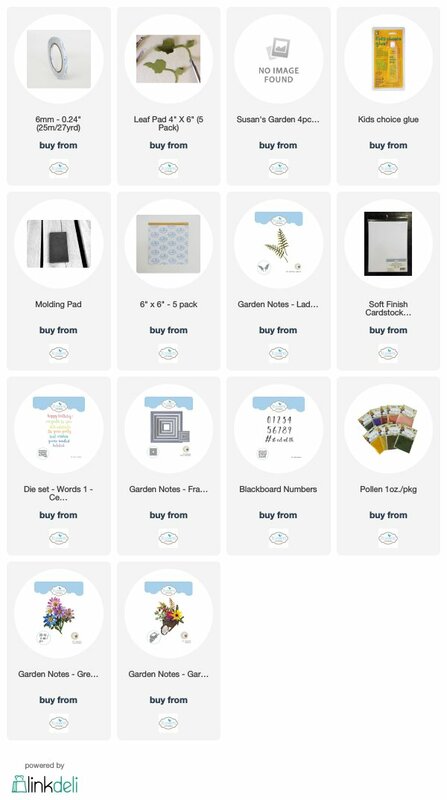 By clicking on any of Elizabeth Craft Designs supplies below it will take you directly to their site. Today I have a card I created for the Elizabeth Craft Designs Blog. Be sure to check out their blog for tutorial for this card. Hello my crafty friends welcome to my blog! Today I have for you a sympathy card I created for a friend. This card could be used for different occasions just by changing out the sentiment. Dies I used are from Elizabeth Craft Designs – Susan’s Garden Notes Helenium, Berry Spray, Baby’s Breath along with Joset Designs Stitched Hexagon and Stitched Fishtail Banners. Here is how I created the card. Step 1 Cut 4 Garden Notes Berry Spray from brown cardstock 2 that have Clear Double Sided Adhesive on back and 2 without the adhesive. Adhere 1 on top of other to form 2 sprays. Using Nuvo Crystal Drops – Autumn Red add berries to spray set aside to dry then repeat for back side. Step 2 Cut Garden Notes Baby’s Breath – stems from green cardstock and flowers from white Soft Finish Cardstock. Shade, shape and create baby’s breath. Susan has some great videos on making her flowers on her Facebook page Susan’s Garden Club. Step 3 From white Soft Finish Cardstock cut petals for 2 Garden Notes Heleniums cut centers from brown cardstock and leaves from green cardstock. Color main petals using alcohol markers in colors of your choice (Copics R59 & R89 used here). See Susan’s video for making these lovely flowers – video found here. Step 5 Cut white Soft Finish Cardstock using #8 Stitched Hexagon. Using Distress Oxide Inks in colors of your choice (Mustard Seed, Aged Mahogany, Dusty Concord and Crushed Olive used here) create a background on hexagon by smearing colors on mat spritz with water and dragging hexagon through it. Heat set and continue until it is to your liking. Using Clear Double Sided Adhesive adhere to back of frame. Step 6 Form 6″ X 6″ card base. Using large embossing folder emboss card front.. Using Clear Double Sided Adhesive adhere hexagon to card front. Step 7 Using Kids Choice Glue arrange flowers and berries on left side of hexagon. Step 8 Cut Fishtail Banner stamp with sentiment adhere to lower part of hexagon. I do hope you have enjoyed my tutorial today and that it has inspired you to created. 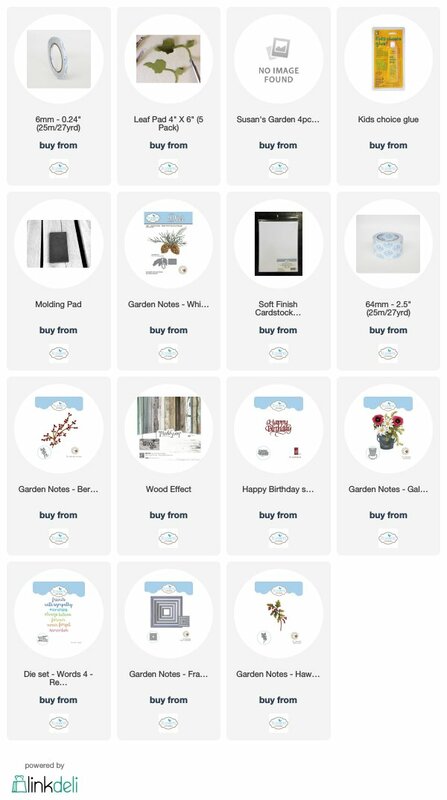 The Elizabeth Craft Designs Supplies used are all linked to their site just click on any picture it will take you to their site. Thank you for stopping by my blog today and until next time – Happy Crafting!